Dragos Tara was born in 1976 in Bucarest, but has lived in Switzerland since the age of 5. 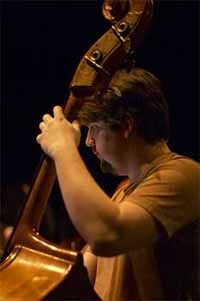 He studied double bass at the conseratory in Montreux and Lausann. From 2002 to 2007, he studied composition and electroacoustics at the conservatory in Geneva. After discovering different musics (rock, jazz, classical, balkan music) he is now active in many projects for improvised music : Hibiki (Laurent Bruttin, cl./CH, Kim Myhr., gt/ Norw. ), a duo with Sébastien Roux (electron./FR), l'Ensemble Silence (live music for silent movies), KikU*2 4tet. Dragos has realized different projects: Performance for musiciens, dancers et electronics in the former jails of Vevey (2005) ; Jeu : duel musical pour double-quartet (2004), solo concerts and a doublebass quartet. He has also written music for various ensembles: Ensemble Vortex, compagnie CH.AU, Ìllorkestrâ, Bolouris 5tet, Ostermundigen symphonic Orchestra.